NILE C. KINNICK 5024 HAMILTON, OMAHA. NEBRASKA Monday July 14  My dear J. Lloyd: [Jim George] My The formality with which you addressed me in your last letter cut me to the quick. I opened the envelope expecting my eye to meet with expressions of tender solicitude and affectinate queries concerning my well-being and happiness. The perfunctory tone of the first paragraph brought tears of disappointment and unhappiness. You are fully aware of the delicate balance of my temperament and yet have thoughtlessly upset me emotionally by the indifferent tenor of your writing. Were I not so devotedly attached to you and the magnificent things for which you stand I would have done with you right now. But you know how I am a slave to your slightest wish, how I grovel at your feet to get to use your skin braser, how servile is my attitude to please you in every way. However, please do not strain our relationship too far or I shall become so despondent that I will go out and hang one on by having a bottle of Green River. Listen, you lug, what do you mean, "I am in receipt of yours of the 9th". It had been so long since I heard from you that I had to write to your mother to find your whereabouts. 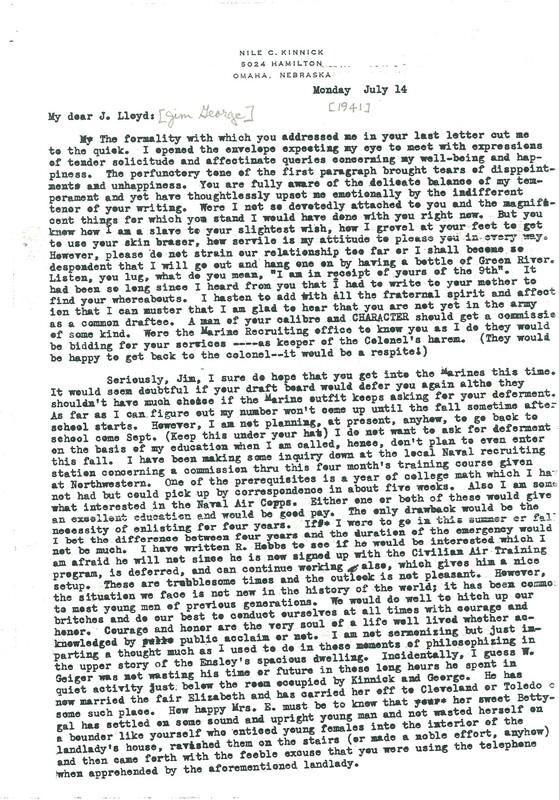 I hasten to add with all the fraternal spirit and affection that I can muster that I am glad to hear that you are not yet in the army as a common draftee. A man of your calibre and CHARACTER should get a commissio of some kind. Were the Marine Recruiting office to know you as I do they would be bidding for your services ----as keeper of the Colonel's harem. (They would be happy to get back to the colonel--it would be a respite!) Seriously, Jim, I sure do hope that you get into the Marines this time. It would seem doubtful if your draft board would defer you again altho they shouldn't have much choice if the Marine outfit keeps asking for your deferment. As far as I can figure out my number won't come up until the fall sometime after school starts. However, I am not planning, at present, anyhow, to go back to school come Sept. (Keep this under your hat) I do not want to ask for deferment on the basis of my education when I am called, hence, don't plan to even enter this fall. I have been making some inquiry down at the local Naval recruiting station concerning a commission thru this four month's training course given at Northwestern. One of the prerequisites is a year of college math which I ha not had but could pick up by correspondence in about five weeks. Also I am somewhat interested in the Naval Air Corps. Either one or both of these would give an excellent education and would be good pay. The only drawback would be the necessity of enlisting for four years. If I were to go in this summer or fall I bet the difference between four years and the duration of the emergency would not be much. I have written R. Hobbs to see if he would be interested, which I am afraid he will not since he is now signed up with the Civilian Air Training program, is deferred, and can continue working also, which gives him a nice setup. These are troublesome times and the outlook is not pleasant. However, the situation we face is not new in the history of the world; it has been common to most young men of previous generations. We would do well to hitch up our britches and do our best to conduct ourselves at all times with courage and honor. Courage and honor are the very soul of a life well lived whether acknowledged by public acclaim or not. I am not sermonizing but just imparting a thought much as I used to do in those moments of philosophizing in the upper story of the Ensley's spacious dwelling. Incidentally, I guess W. Geiger was not wasting his time or future in those long hours he spent in quiet activity just below the room occupied by Kinnick and George. He has now married the fair Elizabeth and has carried her off to Cleveland or Toledo o some such place. How happy Mrs. E. must be to know that her sweet Bettygal has settled on some sound and upright young man and not wasted herself on a bounder like yourself who enticed young females into the interior of the landlady's house, ravished them on the stairs (or made a noble effort, anyhow) and then came forth with tho feeble excuse that you were using the telephone when apprehended by the aforementioned landlady.